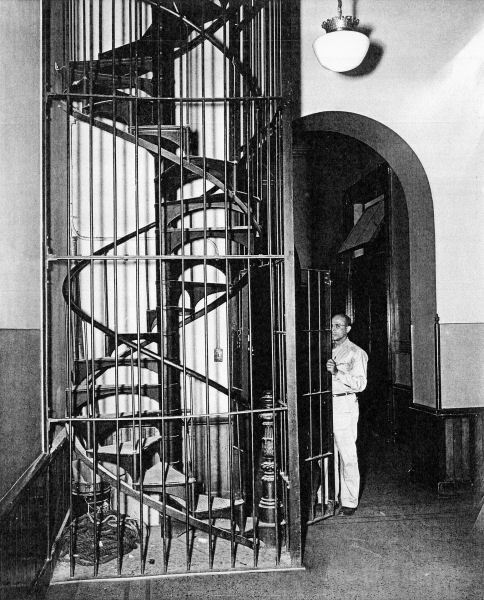 Most likely an entrance to the upper dome, probably located on the fourth floor, circa 1940's - 50's. Photo by Eddie Winfred "Doc" Helm, courtesy Illinois State Archives. 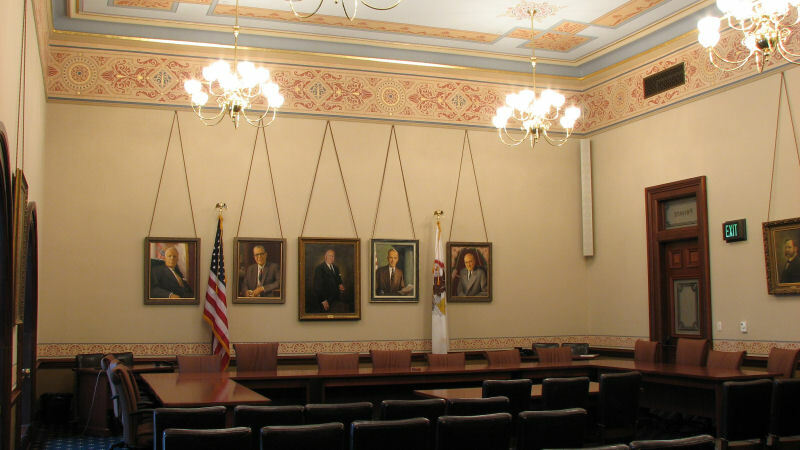 Room 400 - "The Lost Room"
Illinois' battle flags were moved to the first floor of the new Capitol in 1878 and in 1884 they were transferred to cases in the old Art Gallery on the third floor, which had been refurbished as the new Memorial Hall. 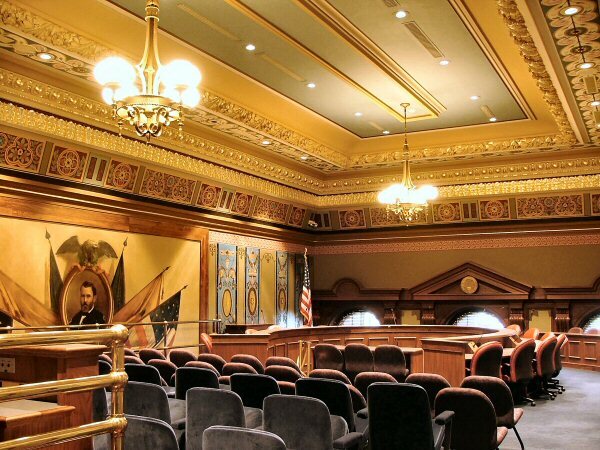 Large murals depicting Lincoln, Grant, and a Civil War soldier were painted on the upper walls of this lofty room. 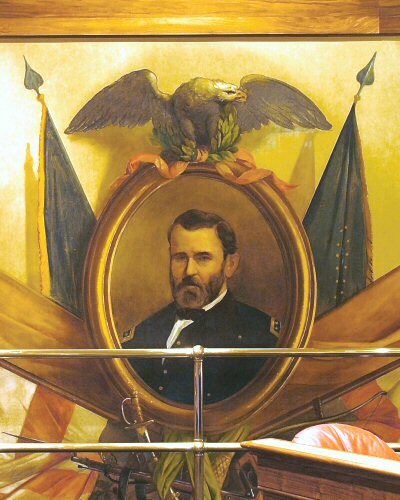 The room was dedicated during ceremonies participated in by Gen. William Tecumseh Sherman on March 26, 1884, in the presence of hundreds of Civil War veterans. 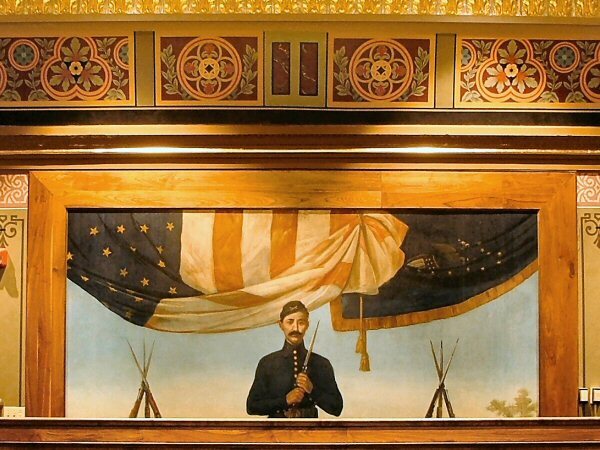 In 1886 the flags were moved, yet again, to a larger area prepared in the southwest corner of the first floor of the Capitol. 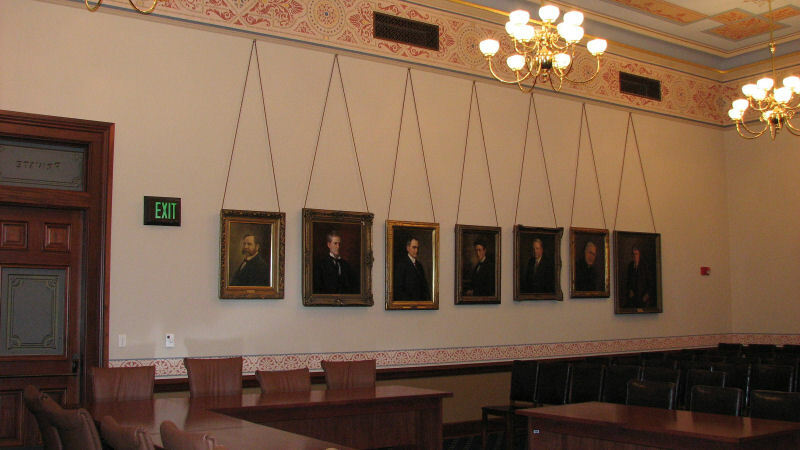 What is now Room 400 has served several different purposes since the removal of Memorial Hall, but in the mid-1930's, the ceiling was lowered and this art was lost. 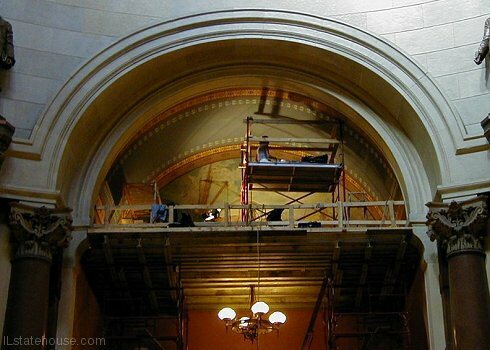 The murals were discovered in 1971 when the false ceiling was removed. 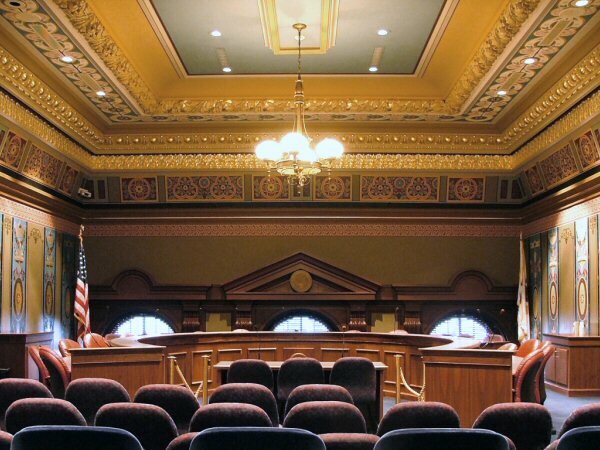 A floor was constructed on the fourth floor level and the area was made into a Senate hearing room. The walls and ceiling in Room 400 have recently been restored to their 1880s appearance. 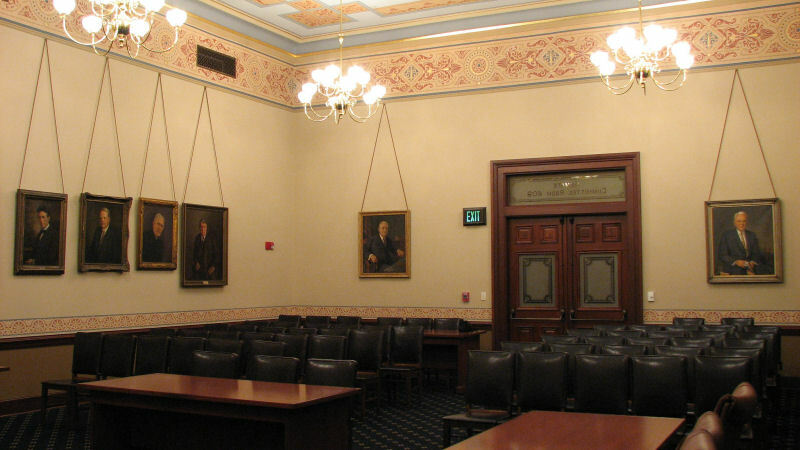 Above: Views of Room 409, the former Senate Bill Room, which has been converted to a Senate committee hearing room. 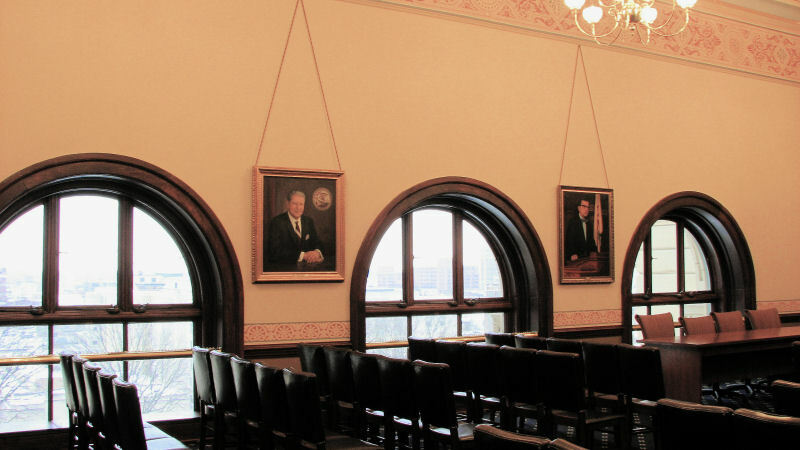 To view a page dedicated to the portraits of Lieutenant Governors and Senate Presidents Pro Tem which are displayed in the room, click here. 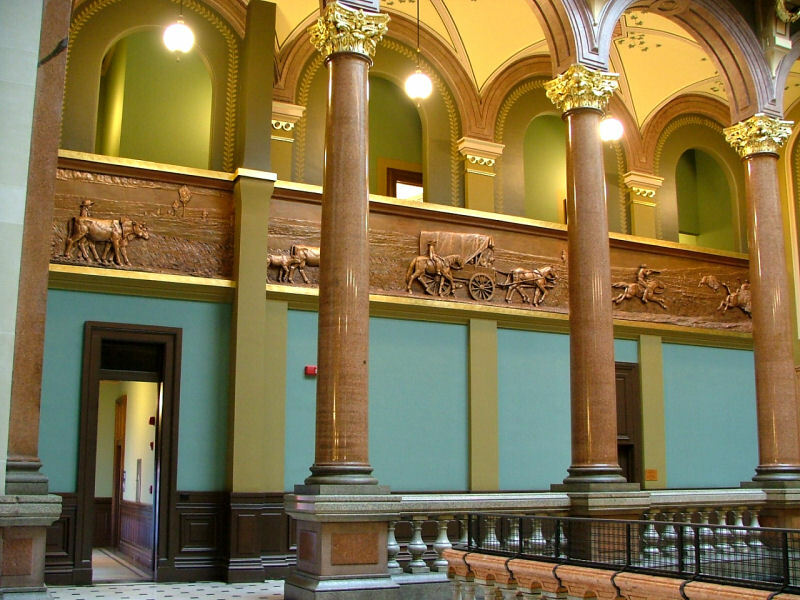 The plaster bas relief sculpture on the north balcony illustrates the migration (or dislodging) of glum Native Americans to the Western mountains in the setting sun. 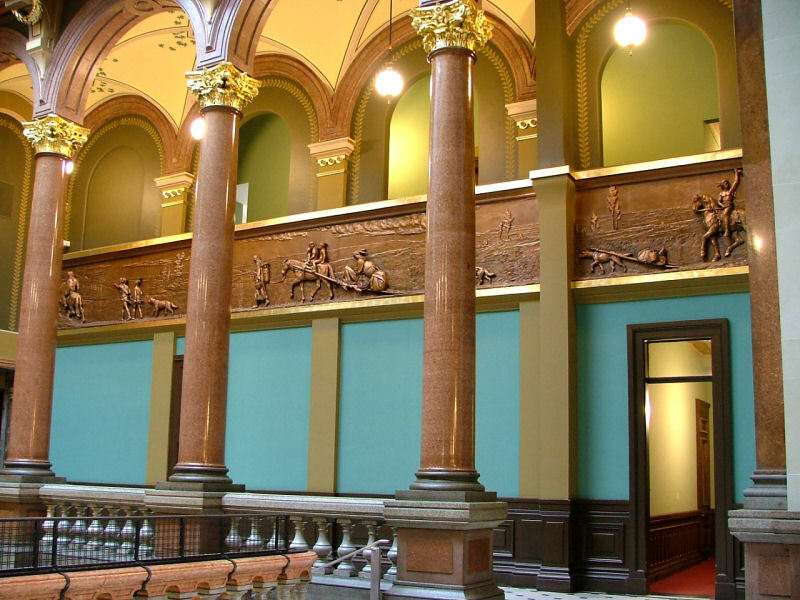 The sculpture on the south balcony depicts enthusiastic settlers killing buffalo and moving West with their livestock. The artist is unknown. 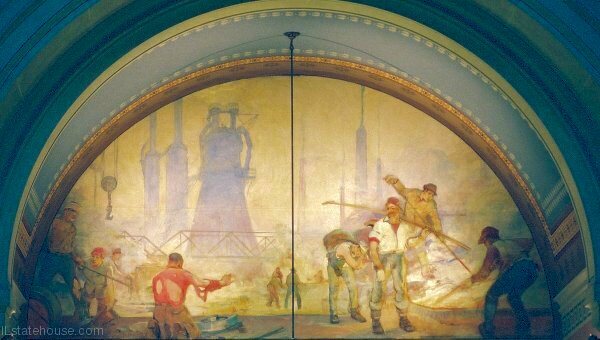 Chicagoan Robert Wadsworth Grafton painted the three large fourth floor murals in 1918 as a part of Illinois' Centennial celebration. 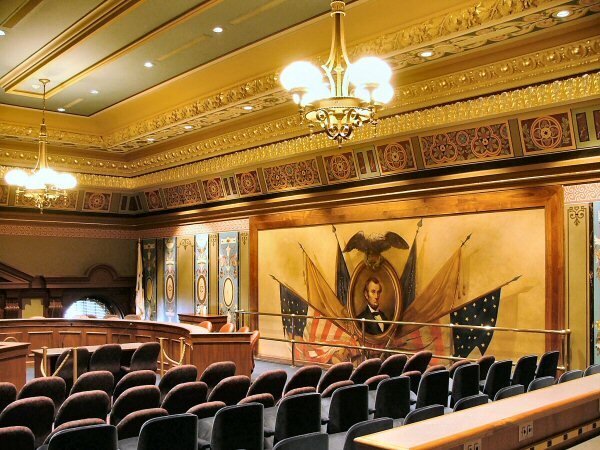 These murals, as well as the rotunda eagles, have recently been restored. 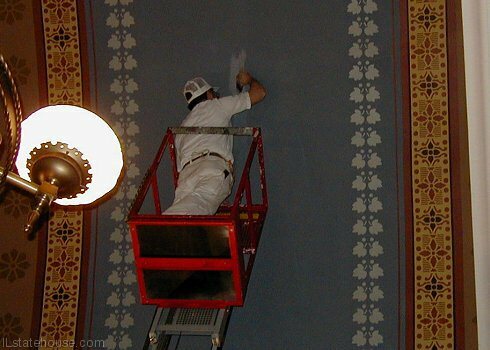 The murals were believed to have been painted directly on the plaster walls but have been discovered to be on canvas, according to restoration specialist, Jan Hessling. East - over Room 400 "Agriculture" - Farmer plowing behind oxen, women sowing seed. "Industry" - Men working at a smelter. Cleaning the painting of George Rogers Clark Removing the scaffold from beneath the Industry mural. 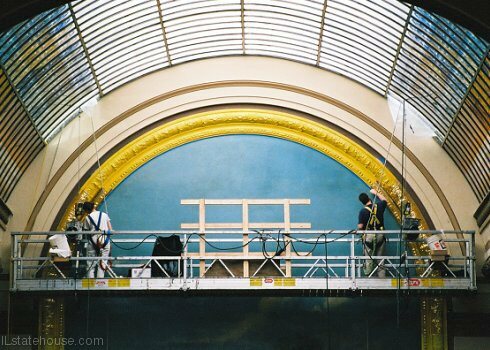 Applying gold leaf to the frame of the Clark mural. 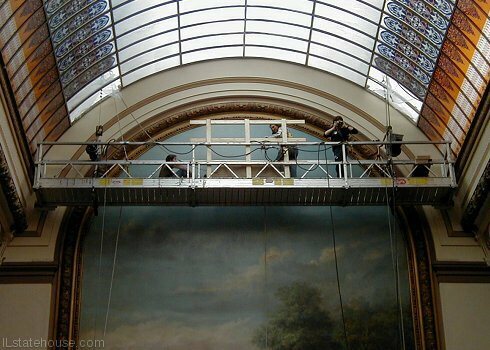 Final touches to the ceiling above the Agriculture mural. 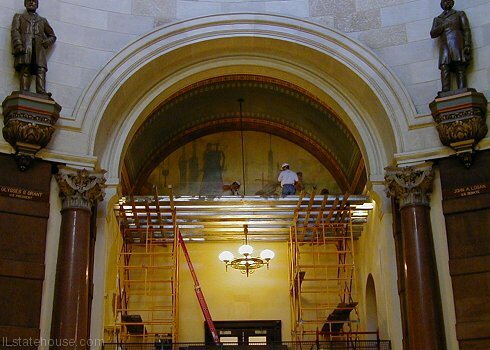 Ceiling over the Commerce mural nearing completion. 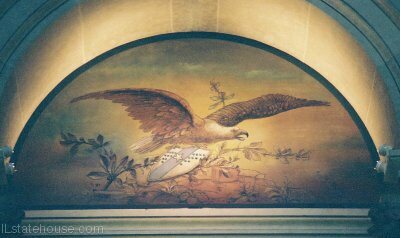 In 1918 Springfield artist George H. Schanbacher painted the eagles and shields between the corbel statues in the upper rotunda as part of Illinois' centennial celebration. The shields have 10 stars on either side of a blue ribbon with a large white star in the center. 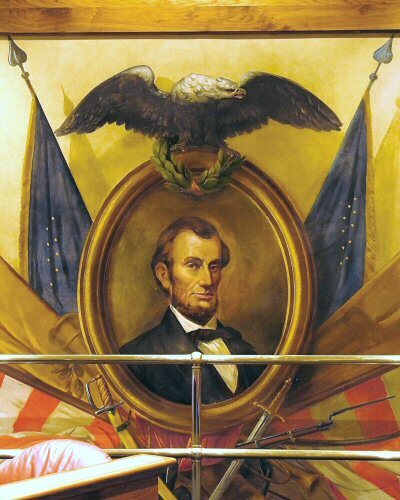 This represents 10 northern and 10 southern states at the time Illinois was admitted to the Union, with the large white star representing Illinois, the 21st state. This shield was modeled after the centennial flag designed by Wallace Rice. Mr. Rice also designed the city flag of Chicago. 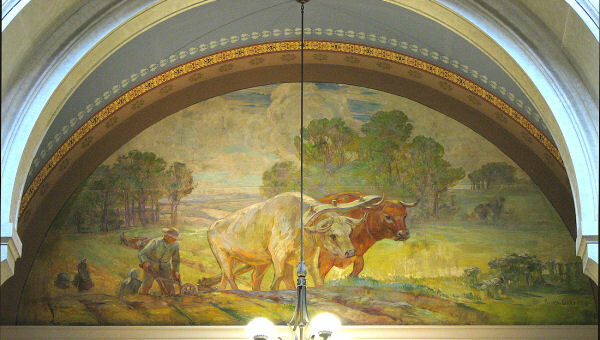 Schanbacher also decorated the ceiling of the State Library (now Senate offices) with murals of owls in 1888. 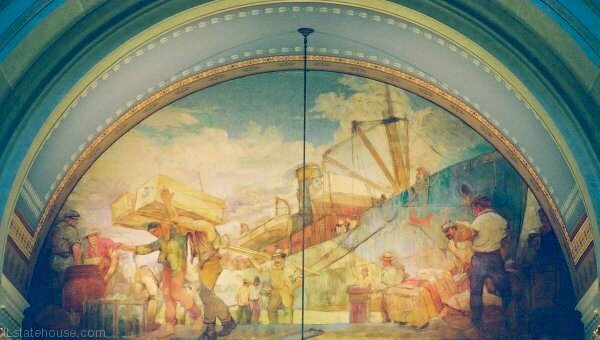 He returned in 1923 and painted over his earlier work when the Library was converted into a legislative lounge. The north and south wings of the building are comprised of six floors, while the center only has four because of the immense rotunda and dome. The fifth and sixth floors were at one time referred to as the mansard wings, a reference to the type of roof over these parts of the building. 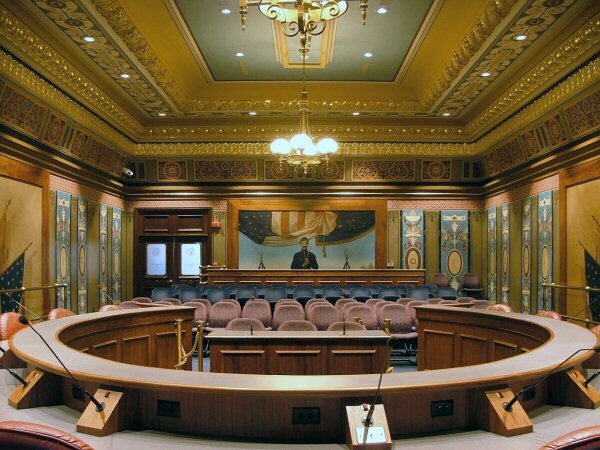 Currently legislative staff occupies the fifth and sixth floors on the House side and on the Senate side, Senate staff uses the fifth floor and the sixth is made up of conference rooms and Senator’s offices.